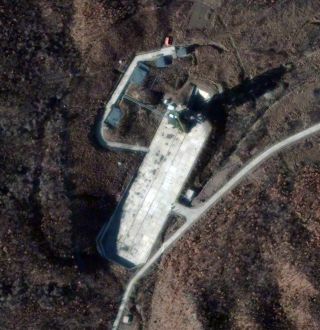 North Korea's Sohae Satellite Launch Station, as seen by a satellite in November 2012. The nuclear-armed rogue nation appears to be making progress on an intercontinental ballistic missile (ICBM), which could conceivably allow the Hermit Kingdom to make good on its oft-repeated threat to turn major American cities into "seas of fire," experts say. "North Korea is probably reluctant to turn the Unha into a ballistic missile, because I think they want something that really is a civil space-launch program that they can point to and say, 'This is what countries do. We're launching satellites; it's not a threat,'" Wright told Space.com. "So my guess is, they won't go that route." "It is much better suited as a militarily effective ICBM than the Unha is," Brian Weeden, a technical adviser for the nonprofit Secure World Foundation, told Space.com. He noted, for example, that the KN-08 can be launched from a truck, whereas the Unha requires a stationary facility. "Using this technology, North Korea's road-mobile intercontinental ballistic missile (ICBM), the KN-08 or the KN-14 modification, could deliver a nuclear warhead to targets at a distance of 10,000 to 13,000 kilometers [6,200 to 8,000 miles]," aerospace engineer and rocket-propulsion expert John Schilling wrote on 38North.org, a North Korea analysis site, shortly after the test. "That range, greater than had previously been expected, could allow Pyongyang to reach targets on the U.S. East Coast, including New York or Washington, D.C.," he added. "I think you can be almost 100 percent certain that they've done [re-entry vehicle] tests on the ground," Wit told Space.com. "That could trigger a North Korean response," Wit said. "It's very clear that they want to send a signal to the West that they can't be messed with," he said. "There's a rationality there." For example, Pyongyang is thought to possess just a handful of nuclear weapons. A 2015 SAIS report co-authored by Wit pegged the nation's stockpile at 10 to 16 nukes. By 2020, this number could grow to 20 in a "best-case scenario," and to 100 in a "worst-case scenario," the report predicted. "It might be the kind of thing you would like to have in your back pocket, to make people think, 'Well, gee, maybe in a bad situation, they might try a Hail Mary pass and see whether it works,'" Wright said. "But it's not the sort of thing that you're going to be able to rely on other than that." "I think the best bet is that they would use nuclear weapons if they felt the regime was threatened in a serious way," Wit said. "Of course, the main way that might happen is if there's a war on the Korean Peninsula, and U.S. and South Korean troops are moving north."